What is up with facebook? 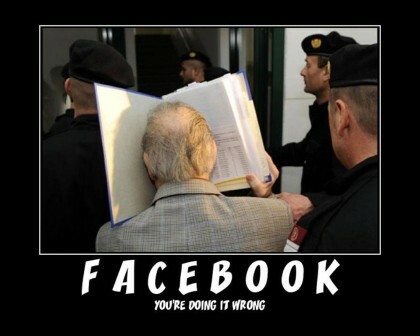 Are you familiar with FaceBook? FaceBook recently changed their design and people aren’t liking it. Well here is a musing taken from a friend’s website hope you like this? It is becoming so obvious that members on facebook are really not happy with the new look…so let common sense prevail & listen to the membership members…at the end of the day..its we members that’s keeping it going..Ive said it before…IF IT AINT BROKEN..WHY FIX IT !!!!!! Just keep FB simple to use. If some want to add on, let ’em. But keep the platform clean and simple for the rest of us. Facebook is confusing enough as it is without them changing the interface around every year, and without any testing with their audience?!?! that’s a bad move. Zuckerberg seems out of touch. No, a Few people don’t. a few of a 175million is going to be 1 – 2 million people, it seems like a lot.. but really its a tiny fraction. Also change happens, Microsoft have been doing it for years, in fact nearly all technology companies have been doing it for years. They push the market the way they want it. Its business, look back centuries and you’ll see. In 1 months time you’ll all have forgotten about a change in skin. So tell us what you think. Is Facebook doing it right, moving on or doing it wrong?